Odisha has a glorious tradition of music.The figures or dancers musicians Carved on ancient temple walls speak of Odisha’s rich musical heritage. There were saint-poets of Odisha who composed lyrical poems to be sung. Bards usually went from place to place singing these songs which were meant to propagate religious ideas in various religious. instructions were usually given by the poet himself as to how the lyric was to be sung, i.e. the raga or tune to be employed and the tala or beat scheme to be followed. Odissi music has a rich legacy dating back to the 2nd century BCE, when king Kharvela, the ruler of Odisha (Kalinga), patronized this music and dance. Ancient Odisha had a rich culture of music, which is substantiated by many archaeological excavation throughout Odisha. At Sankarjung in the Angul district, the initial spade work exposed the cultural stratum of the Chalcolitic period. From here, polished stone celts and hand-made pottery have been excavated. Some of the Celts are narrow but large in size. Thus they are described as Bar-celts. On the basis of bar-celts discovered in Sankarjung it could be argued that they were an earlier musical instrument in India.There is historical evidence in the form of sculptural evidence, i.e. musical instruments, singing and dancing postures of damsels in the Ranigumpha Caves in Khandagiri and Udayagiri at Bhubaneswar. Charya Geetika (poems of Buddhist literature), written between 7th to 12th century mostly by the poets of Odisha and Bengal, are connected with Tantric Buddhism. All India literature on music like Bharat Muni’s Natya Shastra, written in 2nd to 4th century AD., referred to the Odra Magadhi style of music and dance, which belonged to Odisha. Similarly, Sangeet Ratnakar also had a reference to the Odra Magadhi style of music.There are certain texts on Odissi music which are authentic and authoritative, and are excellent indices to the development of the music. These are written in Sanskrit or Oriya and contain the characteristics of Udramagadhi, Ardhamagadhi, Udra Bhasa and Utkalika Bibhasa. These were Oriya Charyagitika by different Oriya Sidhacharyas in the 7th to 11th centuries, Gita Govinda by Sri Jayadeva in the 12th century, Sangita Sara by Hari Nayak in the 14th century to 15th century, Rasavaridhi by Brundavan Das in the 15th century, Oriya Mahabharata by Sarala Das in the 15th century, Rasakallola by Dinakrushna Das in the 16th century, etc. Other books written in later years were Sangita Darpana, Sangit Kalpadruma, Sangitarnava Chandrika, Baidehisha Vilash, etc. It proves that Odissi music is more ancient than its counterparts like Hindustani or Carnati. Even Mahari tradition and singing of Geeta-Govinda in the temple of Lord Jagannath since the time of King Pratap Rudra Dev in the 15th century proves the rich tradition of Odissi. In the temples of Odisha of 7th and 13th century AD such as Parsuramesvar, Muktesvara, Lingaraj and Konark, there are engravings depicting musical performances and dancing postures. After the reign of Mukund Dev in the 16th century AD., Odissi music suffered during the Maratha rule in Odisha during the 17th and 18th century AD. It also did not flourish during the British Raj. Jayadeva, the saint-poet, the great composer and illustrious master of classical music, has immense contribution to Odissi music. During his time Odra-Magadhi style music got shaped and achieved its classical status. He indicated the classical ragas prevailing at that time in which these were to be sung. Prior to that there was the tradition of Chhanda which was simple in musical outline. From the 16th century onwards, treatises on music were Sangitamava Chandrika, Gita Prakasha, Sangita Kalalata and Natya Manorama. A couple of treatise namely, Sangita Sarani and Sangi Narayana, were also written in the early path of the 19th century. Odissi Sangita comprises four classes of music namely Dhruvapada, Chitrapada, Chitrakala and Panchal, described in the above-mentioned texts. The chief Odissi and Shokabaradi. Odissi Sangita (music) is a synthesis of four classes of music, i.e. Dhruvapada, Chitrapada, Chitrakala and Panchal, described in the above-mentioned texts. The Dhruvapada is the first line or lines to be sung repeatedly. Chitrapada means the arrangement of words in an alliterative style. The use of art in music is called Chitrakala. Kavisurya Baladev Rath, the renowned Oriya poet wrote lyrics, which are the best examples of Chitrakala. All of these were Chhanda (metrical section) contains the essence of Odissi music. The Chhandas were composed by combining Bhava (theme), Kala (time), and Swara (tune). The Chautisha represents the originality of Odissi style. All the 34 letters of the Oriya alphabet from ‘Ka’ to ‘Ksha’ are used chronologically at the beginning of each line. A special feature of Odissi music is the padi which consists of words to be sung in Druta Tala (fast beat). Odissi music can be sung to different talas: Navatala (nine beats), Dashatala (ten beats) or Egartala (eleven beats). Odissi ragas are different from the ragas of Hindustani and Karnataki classical music. The primary Odissi ragas are Kalyana, Nata, Shree Gowda, Baradi, Panchama, Dhanashri, Karnata, Bhairavee and Shokabaradi. Odissi music is sung through Raganga, Bhabanga and Natyanga Dhrubapadanga followed by Champu, Chhanda, Chautisa, Pallabi, Bhajan, Janana, and Gita Govinda, which are considered to be a part of the repertoire of Odissi or an allied act form of Odissi. Odissi music has codified grammars, which are presented with specified Raagas. It has also a distinctive rendition style. It is lyrical in its movement with wave-like ornamentation. The pace of singing in Odissi is not very fast nor too slow, and it maintains a proportional tempo which is very soothing. The great exponents of Odissi music in modern times are the Late Singhari Shyamasundar Kar, Markeandeya Mahapatra, Kashinath Pujapanda, Balakirshan Das, Gopal Chandra Panda, Bhubaneswari Misra, Shymamani Devi and Sunanda Patnaik, who have achieved eminence in classical music. Krushnadas Badajena Mohapatra was an Oriya singer in Akbar’s court, and was exposed to the Hindustani classical style of music. Therefore, in this way Odissi music influenced by Hindustani music. Odissi style of classical music has some similarity with Hindustani ‘Dhrupad’ style. ‘Gamak’ is common to both, though Odissi also adopts the ‘Tom Nom’ sounds. The percussion instrument played with Odissi music is the ‘Mardal’, which is similar to ‘pakhawaj’. Temple sculptures in Odisha abound in statues of ‘Mardal’ players. Odissi has certain similarities with the Carnatic style of music also. At one time the Kalinga Empire extended all the way up to the river Kaveri and incorporated major parts of Karnataka. King Purosottam Deva of Odisha conquered Kanchi and married the princess. 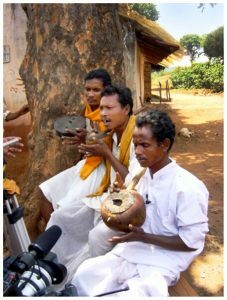 There were many singers from South India in the courts of Odisha. The main singer of the compositions of Kavisurya was Rajamani, a Telugu weaver. Therefore, a strong influence of Karnataki style of music is prevalent in Odissi music. Many renowned Odissi lyricists like Upendra Bhanja, Kavisurya, Gopakrushna, Gaurahari etc. are from South Odisha where Karnataka had a strong influence. It is this interaction between Odisha and South India that led to the widespread singing of Jayadeva’s Astapadis in South Odisha in typical Carnatic style of music. Some raagas specific to Odisha are “Desakhya”, “Dhanasri”, “Belabali”, “Kamodi”, “Baradi” etc. However, compositions are also sung in Odissi style in Carnatic and Hindustani raagas. Some examples of Carnatic raagas used in Odissi music are — “Saberi”, “Mohana”, “Maya Malab Gauda”, “Kamavardhini”, “Sankarabharan” etc. Some examples of Hindustani raagas used in Odissi music are — “Bageshri”, “Malhar”, “Rageshri”, “Bhupali”, “Khambaj”, “Desh”, “Bhairavi” etc. Additionally, some Odissi raagas bear the same names as Hindustani or Carnatic raagas, but have different note combinations. Furthermore, there are many raagas that have the same note combinations in Hindustani, Carnatic and Odissi styles, but are called by different names. Some examples are — Raaga “Durga” in Hindustani is the same as raaga “Sudha Saveri” in Carnatic style is the same as raaga “Kamodi” in Odissi style. In fact, the Hindustani raaga “Chandrakauns” could have developed from the Odissi raaga “Lalita”. The great exponents of Odissi folk music in modern times are the Late Singhari Shyamasundar Kar, Markeandeya Mahapatra, Kashinath Pujapanda, Balakirshan Das, Bhubaneswari Misra, Shymamani Devi, Padmashree Raghunath Panigrahi, Ramahari Das, Laxmikant Palit and Sunanda Patnaik, who have achieved eminence in classical music. In order to popularize the Odissi music the State Government’s Culture Department has undertaken a massive programme named ‘Odissi Sandhya’ to be performed in all major cities of the country. The programme is being executed through Guru Kelu Charan Mohapatra Odissi Research Centre in association with different cultural organizations located in different parts of the country, like Central Sangeet Natak Academy, Eastern Zonal Cultural Centre, Kolkata, and Prachhin Kalakendra, Chandigarh. Programmes held at Chandigarh and New Delhi have already started creating a mild sensation among the music lovers of the country.